Montage is the partnership game of creating colorful crosswords. 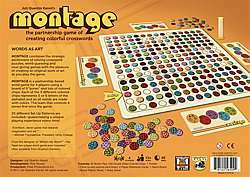 MONTAGE is a partnership word game for 4 players played on a board of 9 'zones' using colored chips. In Montage, each of the 5 different colored chips represents 5 or 6 letters of the alphabet and so all words are made with colors! The side that earns 4 zones first is the winner.